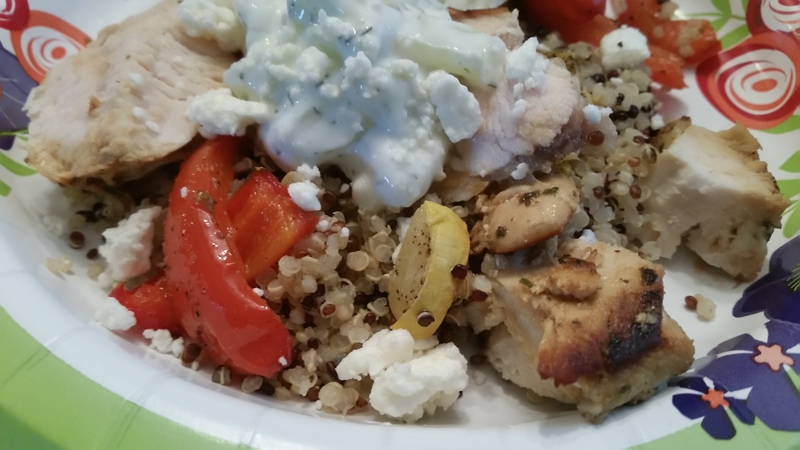 Mediterranean Quinoa Bowl with Roasted Vegetables – What's for Dinner Moms? With my mother’s health problems came a suggestion from her doctor to follow a Mediterranean diet. My mother eats very little other than white toast, pepperoni, and cheese, and drink coffee with a bit of 2% milk. Seriously. She used to be a cook but she never really ate much herself. After chemotherapy and advancing age most of her sense of taste is gone. So, I spent a few days cooking for her showing her how to add tons of flavor and texture to dishes and using things such as quinoa which she had never tried before. Everyone loved this dish. I added a little bit of chicken to this dish to help keep it something they recognize as I am trying to give them options that they will eat and are super easy to make. You could easily make this without the chicken if you wish. Prep time on this dish can be cut down if you prepare several days of vegetables at once when you have free time or your older children can help too! Bag the hearty vegetables and refrigerate or freeze them, depending on when you will use them. More delicate vegetables and fruits such as cucumber and mushrooms tend not to freeze well. Marinate chicken breasts in olive oil, lemon juice, red wine vinegar, garlic, basil, oregano, salt, and pepper at least 1 hour before cooking. In a small bowl mix yogurt, cucumber, garlic powder, salt, and black pepper to taste. Cover bowl and store in refrigerator. Heat oven to 350 degrees. Place vegetables on a rimmed baking sheet and drizzle well with olive oil. Season with salt and pepper. Cook in oven for 30-40 minutes until all vegetables are soft and cooked through. Remove pan from oven. Add 2 tablespoons of olive oil to skillet over medium heat. Remove breasts from marinade and add to skillet. Discard remaining marinade. Cook chicken 10-15 minutes, depending on the thickness of the chicken breasts until cooked completely through. Remove from pan to plate to rest 5 minutes before cutting into bite sized pieces. While chicken is cooking cook tri-colored quinoa according to package directions using your choice of chicken stock, vegetable stock, or water. To serve, fluff quinoa with a fork and divide into four bowls. 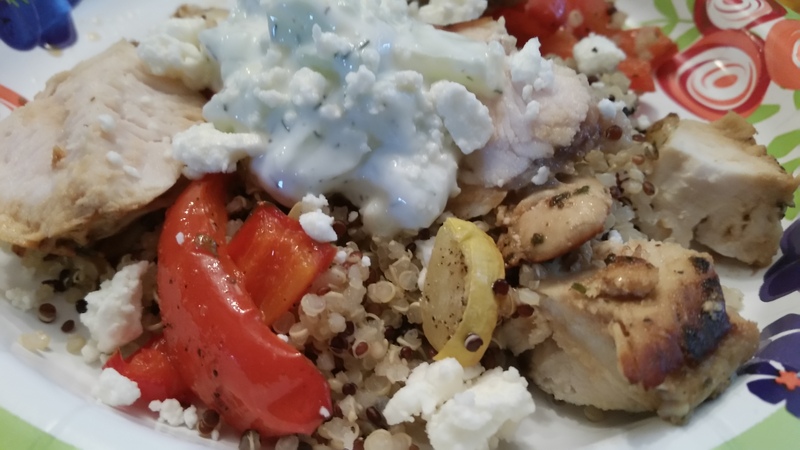 Top with roasted vegetables, chicken, a bit of tzatziki sauce and a sprinkle of feta cheese. Serve hot. I see meal prepping this in my future!! Finally a recipe for my taste. Love it, thank you! Thank, you are most welcome! Hopefully I will have more once a week or so. That is the goal. Look at Buddha bowls. They are the hit right now. I am addicted to them. Will do! Thank you for the idea! Mediterranean food is so good, once you try it you never look back! I love the flavors. Now it is convincing the rest of my family. I am touched by the effort you make that your mom enjoys her food. This one sounds very good and I like the creative combinations. Thank you so much, Erika! I am trying to expand hee food choices. It is another inspiration for new recipes! This one is going on my meal plan for next week! !